A guided breathing experience like no other that supports ultimate mental and physical health and performance. We are all looking for healthy ways to unwind and escape our daily stresses. Yoga isn’t for everyone, mediation is hard, but everyone can breathe. Richard’s guided breathing techniques are proven to: reduce stress and anxiety, improve mental clarity and focus, cleanse the body of toxins, balance your hormonal system and improve cardiovascular health, metabolic and digestive functions. Before teaching breath work Richard worked as a coach helping people with anxiety and depression. Richard has personally trained under multiple modern breath work masters including Wim Hof (Wim Hof Method), Dan Brule (Tony Robbin’s personal breath coach) and Judith Kravitz (Transformational Breathing). With a passion for connection and an expanse of mind-body-soul wisdom acquired through his own journey as a ex-professional soccer player and sports therapist continually inspires Marc to explore the human body. When he came across the ancient teachings of yoga his soul and mind lite up. Learning that the ancient spiritual science offers a direct means of stilling the natural turbulence of thoughts and restlessness of body that prevent us from knowing what we really are. His curiosity of self and our connections with others and the world Marc loves to share and endeavors to create a space for others to tap into their true nature, higher self… your teacher within you. Half English, half Mexican, Mariel has practiced Ashtanga and Vinyasa Flow yoga around the world for over a decade. Leaving behind her high powered and high stress corporate job that left her unfulfilled and unhappy, she achieved her long-time dream of becoming a yoga teacher. 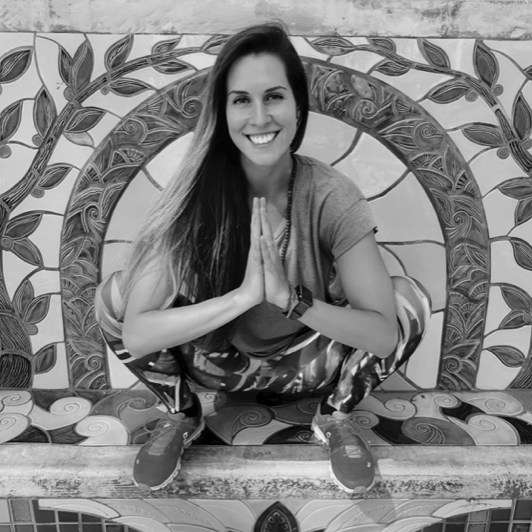 A firm believer that what you give out, you get back, Mariel hopes to share with others the countless ways yoga has positively impacted her life – bringing unending awareness to her self-journey through lessons in humility, perseverance and acceptance in order to live her best life.